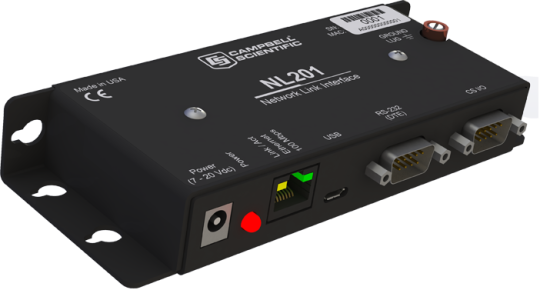 Campbell Scientific’s new NL201 Network Link Interface provides a wired Ethernet network connection for dataloggers and peripherals. Improvements over its predecessor, the NL200, include the addition of a ground lug and internal Ethernet surge protection, as well as the ability to be powered by the datalogger’s CS I/O port. 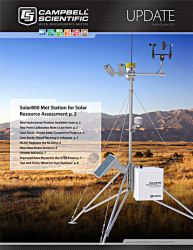 The NL201 allows our dataloggers and other serial devices to communicate over a local-area network or a dedicated Internet connection. This interface supports sophisticated networking capabilities for PakBus devices and networks. Using a unique technique to bridge the Ethernet and CS I/O ports, the NL201 can provide direct access to the integrated IP functionality of our CR800, CR850, CR1000, or CR3000 dataloggers. The NL201 can also act as a standard TCP serial server, serial client, Modbus TCP/IP gateway, and TLS proxy server for HTTPS and user-defined-port communication. By providing both simple Ethernet communications and complex networking capabilities, the NL201 is a powerful device that can meet your networking needs in a wide range of applications.